Arrow Sewing Cabinets: Book Nook - "Sew What You Love"
Book Nook - "Sew What You Love"
Pretty soon summer will officially be here, so we want to make sure you've got a great sewing book to inspire you to make a few summer projects! 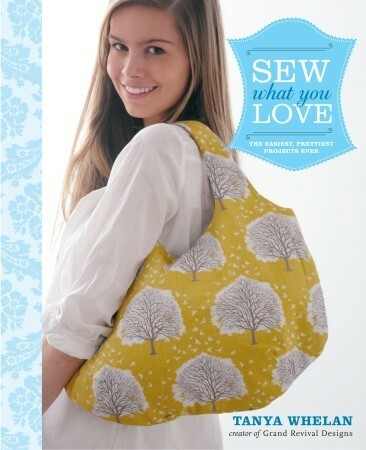 Our pick for this Book Nook is "Sew What You Love" by Tanya Whelan. If you're not familiar with Tanya, she is a fabric and pattern designer, sewer, and author. She also has a line of home accessories. Visit her blog at http://grandrevivaldesign.typepad.com/ if you'd like to see more of her work, we think you'll love it! Now, let's talk about the book. First off, it's spiral bound, so when it's open it lays flat. This is so helpful when you're trying to follow along with one of the projects - you don't have to worry about losing your spot! There are the usual sections in the front of the book - sewing definitions, basic tools needed, etc. - all very helpful of course, especially if you're a beginner. After that, the fun begins! There are 30 projects in the book, grouped by type - bags, projects for kids, home projects and wearables. Tanya even includes two helpful techniques sections - one on shirring, and one with tips for sewing with knits. There are step-by-step instructions and illustrations for every project which make them easy to follow. I am in love with the Pretty Pleated Clutch, so that's the first project I'm going to tackle! We think you'll enjoy this book as much as we did, so Potter Craft is generously donating a copy for us to give away! Leave a comment here telling us why you'd like to win it. Make sure the comment also includes your first name, last name, city and state so we can find you. Be sure to like us on Facebook as well, and fill out our contest registration form - the link is located on our Facebook page. Deadline is Tuesday, June 19th, 2012 at 5 pm Eastern time. Last but not least, we'd like to announce the winner for our previous Book Nook. It's Joanne Hios from Cary, NC! Congratulations Joanne! I would dearly love to win ANYTHING that has to do with sewing, reading, or just to finally win something!! I love Tanya Whelan - her fabrics and blog are wonderful. I've heard great things about the book and love the sample projects I've seen, so I'd definitely love a copy! I just bookmarked Tanya's blog and love the projects, they are beautiful. I would love to win this book because I still read books the oldfashion way and this is a great one to have. I would love to have this book in my project/reference bookcase. You can never have too many sewing books! I haven't received a new projuect sewing book in many years so it's about time to add one. I would love to receive a copy of it! My next sewing project(s) are wearables and I would like to try sewing with knits and I am sure her advice would be very useful! Sprial bound books rock especially for project/books! I would love to have this book for summer projects. The bag on the cover is a must sew soon...too adorable! I need some easy projects for a young student. I'm sure this would help! Thanks for the review. My comment evaporated. I want to make that pretty pleated clutch too... saw it in some other blog posts. It would be my first purse! Thanks for the chance to enter this giveaway - love her fabric and designs. I would like to win this - a good sewing book that's spiral bound! LOL! looks like a wonderful book with fun projects perfect for teaching the kids in 4H! Looks like my kind of book!! Looks like a great book for projects. Spiral bound, even better. Can never have to many sewing books for tips, tricks and inspiration. Would love a new addition to my small collection. Books are how I am learning new techniques in sewing. Always looking for new ideas because I love to sew! Would really love this book! Always looking for new ideas. One of the first bags I ever made was by Tanya Whelan and I loved making it. I'm sure I'd love a woke book even more! I would love this as my 1st project book of a soon to be collection of such! I want this! I can't get enough organizing supplies and new furniture to make my sewing room better and better! I would like to win this book because I need all the ideas and help I can get! With 30 projects to choose from, there is bound to be something for yourself, your kids, those grand kids. I can't wait to look through the ideas to pick that first project ... just might be the purse on the cover for me. I'm just starting to build my sewing library, so I'd love to add this! I would love to win this! A new summer bag would be the perfect project! I am so far behind on reading blogs! Congrats to all the winners that I may have missed congratulating! yummy and clever too. a great book to have. Love the spiral binding. yes, it needs to be mine, I have the sewing machine threaded and waiting. Would be very nice to win anything sewing related. Would like to see some of these products in Canada. I'm just getting back into sewing, and would love to have this book to inspire me! Sew what you love! What a great motto- and that's what makes sewing so rewarding. I would start with the bag on the cover! Love it! I would love to win this book so I can have some new motiviation to get to the sewing table and stich something up! Would love to win this book looks awesome. This looks like an amazing book! Love the bag on the front! i need to get my machine out and find a spot where i can leave it. mabye this book will get me motivated. I would sooo love to win this book!!! My grandkids are going to visit for summer and they love to make things. Great way to teach!! Would love new project ideas and would love to win this book!!! I would love to win this book. Besides using it for myself I would share it with my 4-H Sewing group! This looks like a great book, I'd love to add it to my collection. I am a beginner sewer and need help! How can anyone turn away from a book about one's favorite thing to do? Just love to look and get inspired. Our 6/1 Swag Bag Winner! Buckle Up! We've Got A New Contest!